Kolkata July 12 (IANS) Terming the allegation of trafficking and selling of children against Missionaries of Charity "unbelievable" CPI-M General Secretary Sitaram Yechury on Thursday said the law should take its course but the nuns should not be harassed or prosecuted before the charge was proved. Yechury said though the Marxists had differences with the MoC they had the "highest respect" for them. "Mother Teresa s Missionaries of Charity is a renowned and respected organisation. Despite our differences we have the highest respect for them. It (the charge) is unbelievable. Let the law take its own course " he told reporters here. He said one should wait for the investigation. "There should not be any harrasment of the nuns or prosecution just on the basis of heresay. Let the matter be investigated " he said. 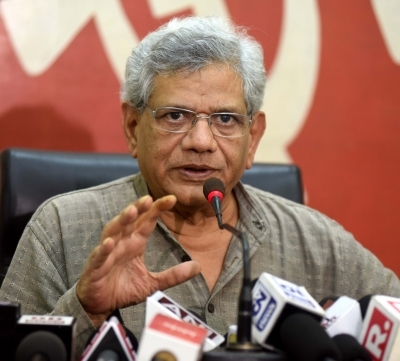 Yechury s remarks came on a day West Bengal Chief Minister Mamata Banerjee accused the Bharatiya Janata Party (BJP) of making "malicious attempts to malign" the Catholic order. "Mother Teresa herself set up Missionaries of Charity. And now they are also not being spared. Malicious attempts to malign their name. The Sisters are being targeted. #BJP want to spare no one. Highly condemnable. Let MOC continue to do their work for the poorest of the poor " Banerjee tweeted. The two leaders comments followed complaints that trafficking and selling of children were rampant in Jharkhand s Ranchi Nirmal Hriday a Missionaries of Charity shelter home. Jharkhand Police had arrested a nun and an employee of the Catholic Order last week for allegedly selling a child of an unwed mother for Rs 1.2 lakh to an Uttar Pradesh-based couple. They also alleged that MoC was unable to provide records of births by 280 women at its homes in Ranchi. According to police 450 pregnant women were admitted in various homes run by the Order founded by Mother Teresa between 2015 and 2018 but there are records of only 170 childbirths and no information about the remaining 280. The matter came to light when the couple who had taken a newborn from the charity home in May complained that they had paid Rs 1.2 lakh for medical care and delivery of the child but the baby was taken back by the charity with assurances of returning it after court procedures. The couple complained to the Child Welfare Society after they failed to get the child.